February 16, 2017 (Greenwich, CT) – The Greenwich Association of REALTORS® announces the statistics for home sales in The Town of Greenwich, CT. for the month of January 2017. There were 42 single-family residential closings reported during this period according to figures provided by The Greenwich Multiple Listing Service, Inc., the multiple listing service used by REALTORS® in the Greenwich area. The number of single-family residential closings increased by 62%, compared to January 2016 when there were 26 closings. The median sales price for a single-family home increased to $1,762,500 from $1,670,000 the median sales price in January 2016. The average days on the market for residential homes was 238 days; which was an increase from 169 days in January 2016. “The post-election closings were strong in December and January. The spring market began early this year and February continues to be busy with inventory that had been on the market for a while starting to close. There were ten sales over $3million and one sale over $10million. Greenwich had 24 of the sales in January and Cos Cob, Riverside and Old Greenwich almost equally split the remaining sales. The current inventory is less than last year’s count. Buyers should be ready to participate in a competitive spring market,” stated BK Bates, 2017 President of the Greenwich Association of REALTORS® . CoreLogic’s latest Home Price Index shows that prices rose by 7.1% across the United States year-over-year. With mortgage interest rates rising in the short term, CoreLogic believes price appreciation will slow to 4.7% by this time next year. 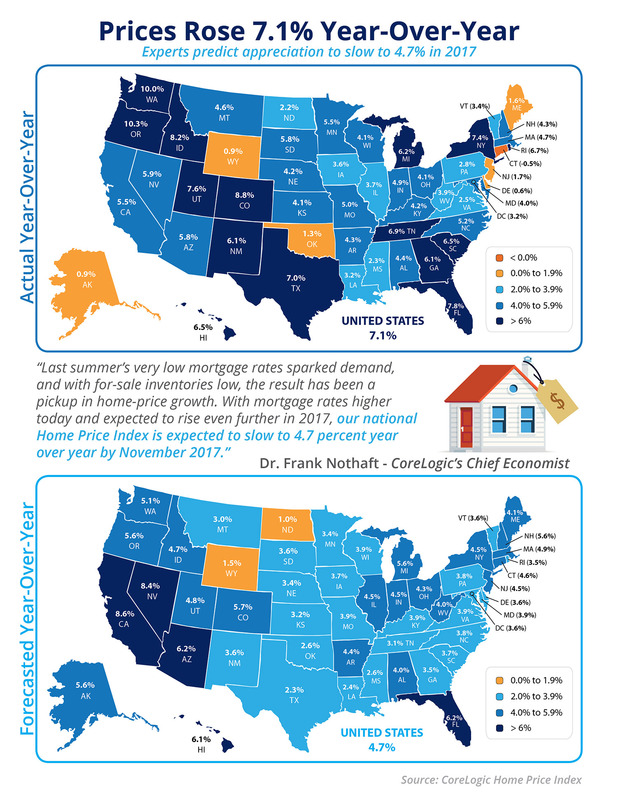 49 out of 50 states, and the District of Columbia, all had positive appreciation over the last 12 months, with the only exception being the state of Connecticut, which experienced a -0.5% appreciation.